"Gluten-free and wheat-free delicious bread alternative. For dairy-free, please skip Parmesan." Preheat oven to 350 degrees F (175 degrees C). Grease one 9x5-inch loaf pan. Stir almond flour, Parmesan cheese, ground flax seeds, baking soda, and salt together in a large bowl with a fork until well-combined. Whisk eggs, almond milk, vinegar, and olive oil together in a large bowl until well-mixed. Pour egg mixture over flour mixture and whisk well until dough comes together, about 1 minute. Dough will be very thick. Pour dough into pan and smooth top. Bake loaf in the preheated oven until golden and a toothpick inserted in the center comes out clean, 35 to 40 minutes. Set pan on a wire rack to cool for 5 minutes. Cover pan with plate or cooling rack and invert to tip loaf out. Let cool down for 20 to 30 minutes before serving. Substitute Gruyere cheese for the Parmesan cheese if desired. 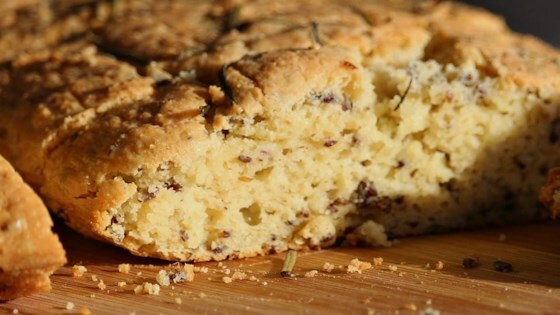 Flavor bread dough with 1 teaspoon onion powder, 2 teaspoons finely chopped fresh thyme or rosemary leaves and 1/2 teaspoon garlic powder before baking if desired. Store leftover bread in the fridge up to 3 days. One of the best gluten free breads I have ever made and tasted! Absolutely delicious! I will definitely be making this bread again! i didn't have Parmesan cheese so I omitted it and followed the recipe exactly. It was ok, a bit dry and not much flavour. I'll try it again with Parmesan next time.